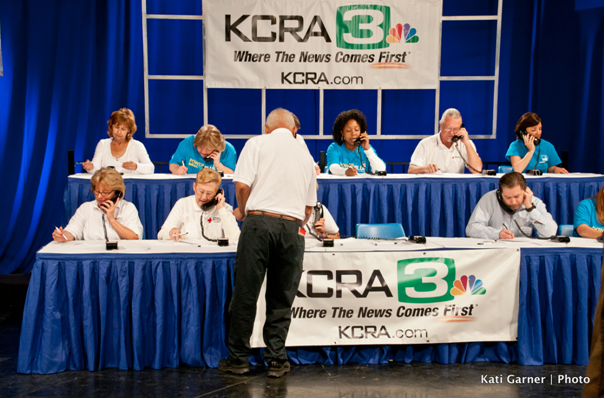 KCRA has once more stepped up to support the American Red Cross and our local communities! Currently, the American Red Cross is helping more than 1,130 people at 7 shelters across Northern California that have been affected by the Rough, Butte and Valley Fires. At the shelters, Red Cross volunteers are providing meals, personal hygiene items, cleaning supplies, health services such as replacing medications and eyeglasses and emotional support for the people affected by the fires. The telethon is scheduled for tomorrow, Tuesday, September 15 from 4:30 a.m. – 7:00 p.m. on KCRA3, with a cut-over to MY58 from 7:00 a.m. – 9:00 a.m.
Help people affected by the California Wildfires. Your donation enables the Red Cross to prepare for, respond to and help people recover from these disasters. The telethon number to make a donation is: 800-513-3333 and it will be staffed by Red Cross volunteers and corporate partners. We have some exciting check presentations by our wonderful community partners! Thank you to everyone who has been calling to help! Call: Laura Thompson, r | 916-993-7080 | Please note, this is a recording, please leave a message and Laura will call you back to ask for your donation which will be designated to the California Wildfires.